A more fire retardent alternative to the PVC version, this is a biwire 4 core "Low Smoke Zero Halogen" QED cable which also comes in a 100m box and 300m reel or as a 2 core version. Earn 2 loyalty points when you order this item. QED QX16/4 LSZH is a bi wire 4-core high performance and exceptional quality installation speaker cable with the added bonus of a fully certificated Low Smoke Zero Halogen (LSZH) fire rated design. It delivers excellent levels of performance in all multi-room and home cinema installations. QX16/4 LSHZ has colour-coded conductor sheaths and is sequentially metre marked - counting down so you always know what you have left on the reel or in the box. Large cross-sectional area of high purity copper conductors. Ensures good performance levels are maintained even on longer runs. 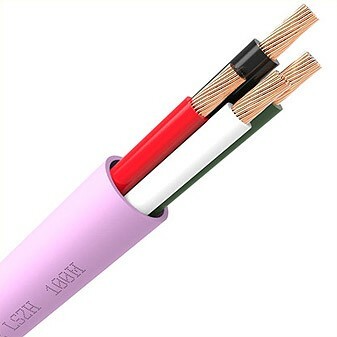 Most cables feature PVC insulation, some have a basic fire rating such as CL3, etc. Unfortunately, most cables give off hazardous toxic smoke during a fire, posing a very serious health risk. LSZH cables are made from a special compound that performs as well as PVC insulation, but crucially gives off very little smoke and no halogen toxins in the event of a fire. Many leading architects and builders along with commercial and marine designers are now specifying LSZH spec cables as standard. Only LSZH cables meet the legislated fire specifications for boat installations. Each complete QED Professional cable design is fully tested to LSZH standards and reports are available on request. We don't just use a fire rated jacket material over an ordinary cable assembly; each complete cable design including jacket and all internal conductors has to undergo rigorous fire safety testing.